Getting from Split to Hvar town is quite easy; most common problem travellers have is to get the ferry / Catamaran schedule match there itineraries, the biggest problem in that relation, is that the regular Catamarans has a schedule, which is adapted to the needs of the people living on the island and working on mainland, which means it is not all to great for a daytrip from Split to Hvar. 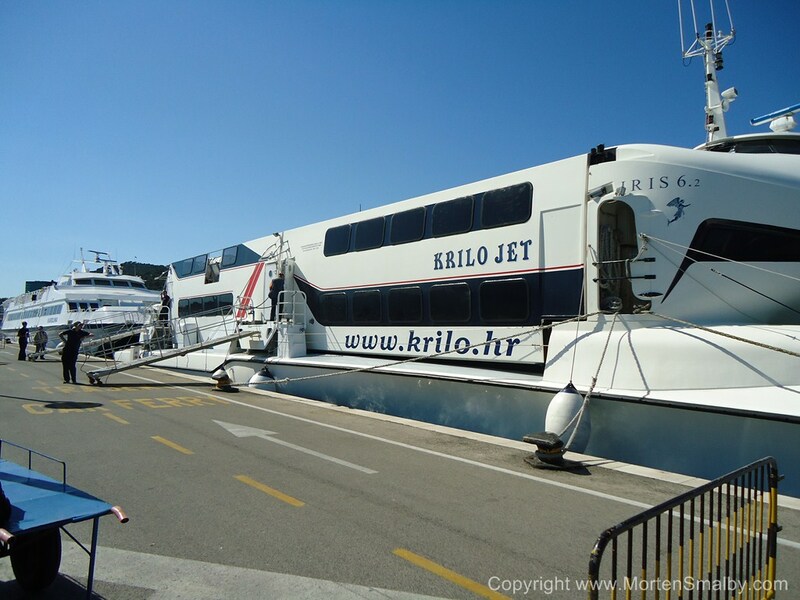 General about ferries and catamarans to Hvar, ticket reservation is not possible, (Except for the coastal ferry and international ferries stopping in Stari grad), ferries and Catamarans routes are operated by several companies. Scheduled Catamarans Split to Hvar. During Sommer months, you have up to 7 catamaran departures in each direction, the first catamaran departures is 07:40 am from Split, the last departure from Hvar is 19 pm, as travelling time is about 1 hour, you have plent of time to see Hvar town. 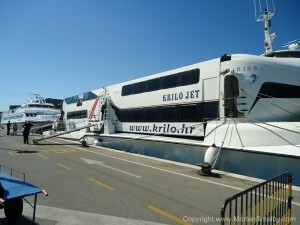 Daytrip Hvar town with Catamaran: Don't wait with getting a ticket for the catamaran. In the summer the catamarans are often full, so if you plan to catch the 07:40 am departure from Split, it is advisable that you buy the ticket early in the morning or even better one day ahead. Once you arrive on Hvar first thing you have to do is to go and buy you return ticket (see map below). For the afternoon departure, you will have to buy the ticket at the agency Pelegrini (Krilo jet) or from the Jadrolinja office, see map below for explanation. If you plan to catch any of the other catamaran departures either from Split or Hvar, it is also advisable to buy the ticket well ahead. Car ferry and bus to Hvar town: During summer months there are 7 daily car ferry departures between Split and Stari grad, the trip with the car ferry takes about 2 hours. At the ferry port in Stari grad you will find bus for town Hvar. (the bus schedule between Hvar and Stari grad ferry port is adjusted to the ferry table), the bus leaves about 20 minutes after ferry arrival, the bus in the other direction departures from Hvar, app. 1.5 hour before scheduled ferry departure. If you are bringing a car to Hvar it is advisable to be at the ferry port 1-2 hours before departure, as it can happen that the car tickets are sold out. Daytrip Hvar with Car ferry: Using the car ferry for a daytrip to Hvar is for sure possible, although you will have to spend a total of 6 hours on travelling. The trip on the ferry boat is quite beautiful and being outside on the ferry is much more comfortable than on the catamaran.